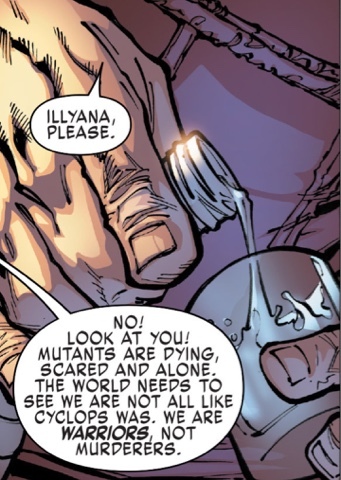 The Secret Wars are over, the Terrigen Mists are sterilising mutants, Cyclops has done something terrible, everybody hates muties... considering this is meant to be All New, All Different Marvel, it's surprising how Same Old, Same Old it feels. A new X-Men title should be an event, but it seems little but the details have changed in the world of the mutants. And because the end of Secret Wars has been delayed, we're not even allowed to be privy to those details. 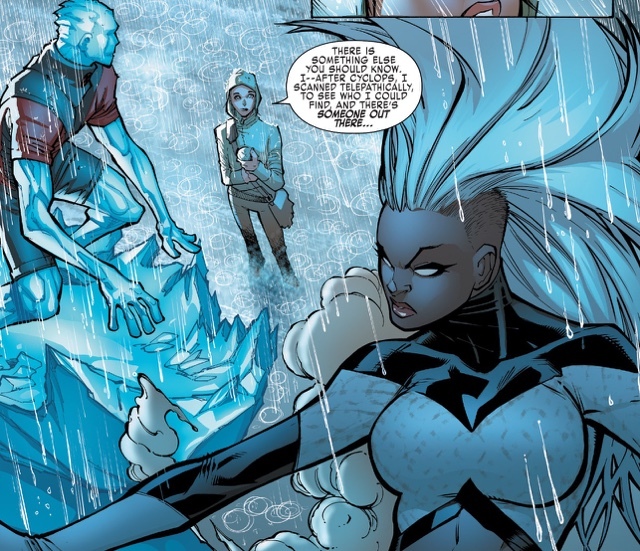 Storm has organised something called X-Haven, which seems to be the old school but in a pocket dimension. Magick is rescuing young mutants from baying crowds. Colossus is trying to be a farmer for the zillionth time. Beast is off researching a cure for the mists business. Nightcrawler is spouting Biblical verse yet again. And Cyclops? Oh for crying out loud, Marvel, if you're going to put this book out, just let writer Jeff Lemire tell us what Cyclops did. Presumably people aren't referring to him killing Professor X while possessed by the Phoenix Force, that was ages ago. The coyness is hugely irritating. 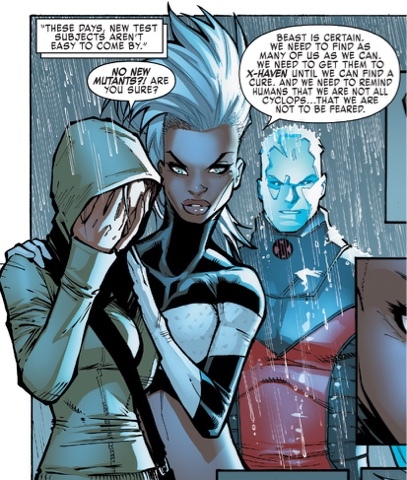 Humberto Ramos isn't my favourite penciller. If Lemire - who I don't doubt will eventually find a way to sneak something interesting into the series - weren't on this book I'd not have bothered with it. As it is, this is better than average Ramos, with the anatomy not so skewed as is often the case. 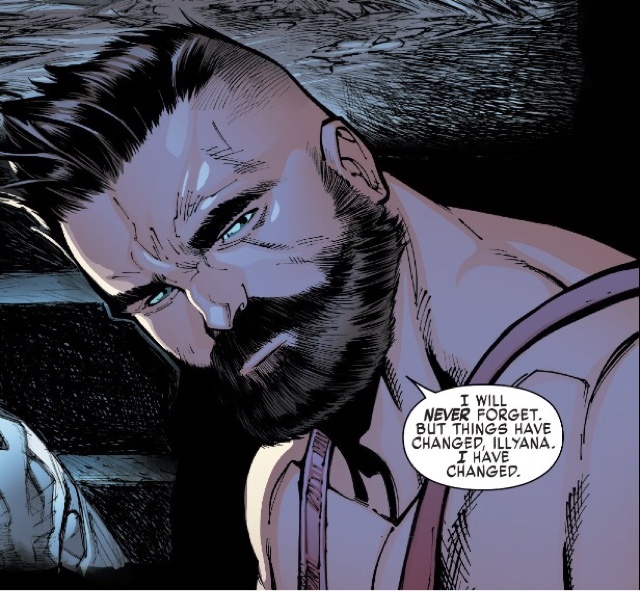 And he - together with inker Victor Olazaba and colourist Edgar Delgado - has Peter Rasputin looking great facially... It's a shame the metalled-up version is just hideous, a misshapen slug of a man. 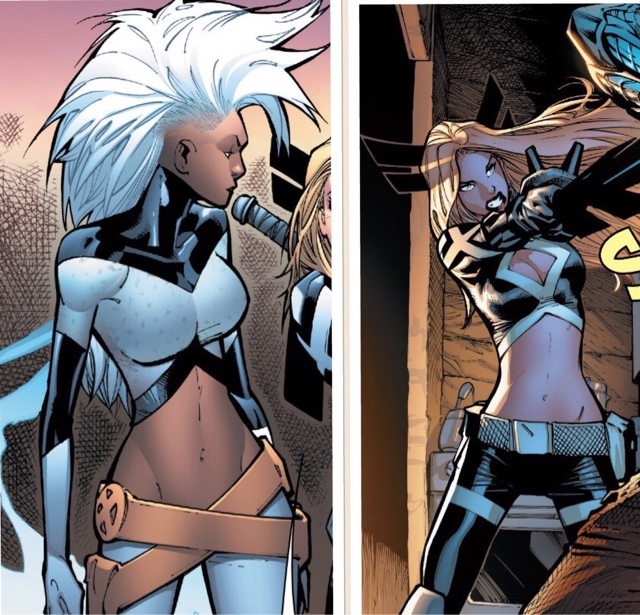 And do Ororo and Illyana have to be dressed like this in these days of supposedly non-sexualised Marvel costuming? No, they don't - so why are they? 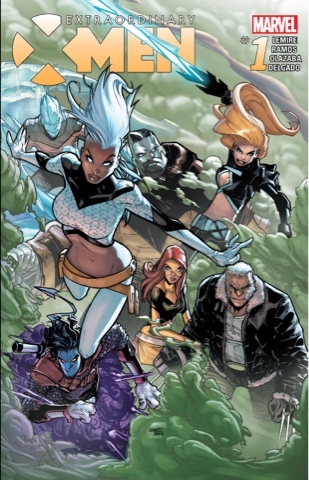 You know what an extraordinary X-Men book would be? One in which it's not all doom and gloom, one in which the heroes get to play baseball like in the old days, fight villains whose every other word isn't 'mutant'. We've had decades of persecution as the dominant - actually, only - theme of X-Men comics, and while it obviously resonated, there has to be room for one book to do something new. This isn't it. This is the Terribly Ordinary X-Men. We just went through this "What happened?" crap over at DC in the Superman books. I'm not a Lemire fan (don't hate him, not even what I've read of his) but I've always detested Ramos' work. When Bendis took on a couple of X-Books I started getting them and enjoyed them. This? Pass. "This is the Terribly Ordinary X-Men," indeed. I wish Marvel would cancel everything but one X-Men and one New Mutants book, unless they're willing to let someone try something new. Glad you enjoyed the book, Veronica - they're so expensive, it'd be a shame if everyone wasn't enjoying. I've only really liked Ramos on Impulse, and only very rarely dip my toe in the X-waters (recently with Bendis, and before with Morrison.) Lemire's never been a draw for me (I don't really see what people like about his superhero work). So this one misses in every regard with me. You know, it's so long since Ramos was at DC that I'd pretty much forgotten how much I liked him on Impulse. It was his Spidey that really put me off his work, and it's not gotten much better. Martin, how would you compare this issue to Lemire's work on Justice League United? I had such high hopes for that title (JLU). I wonder if Lemire is facing the same issue Charles Soule had on Inhuman. 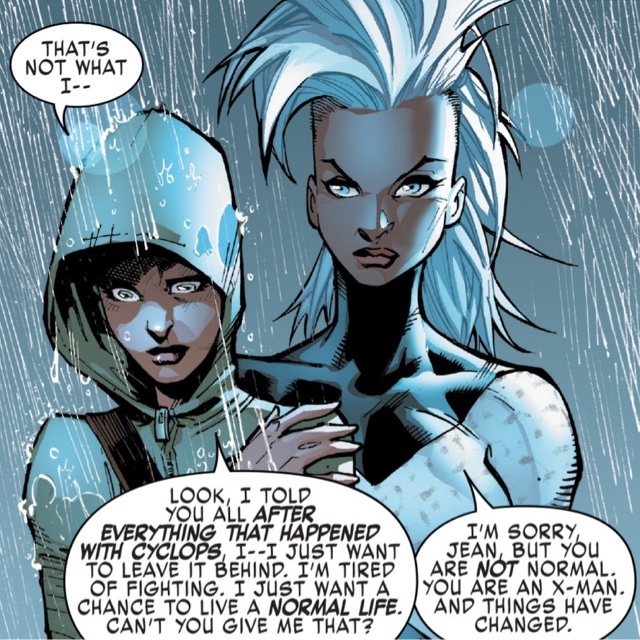 Both were trying to make a title their own because the original writers decided to leave the book (Matt Faction - Inhuman & Rick Remember - Extraordinary X-Men). I like his JLU work much, much more. There was a feeling of newness, of possibility. With the X-Men, it feels like we're going nowhere fast. My favourite Lemire superhero work was his Suoerman run - I love cyberfrogs. I've given the X-Men up so many times it's a joke, beginning after X-Men #200, but I always pop back, hoping for something good again. I think the last time any X-book felt truly fresh was when Peter David and Joe Quesada took over X-Factor. I missed Magick being a pretend Magick. I'm still waiting for her to go back to her proper age! Oh god, are they still running with the whole Cyclops Is The Worst thing? Yes, it's going on and on and on...I'm ready for Cyclops to remember who he is, because Scott as antagonist just isn't working.